Cutting costs and making sure a restaurant stays sustainable is a huge challenge faced by restaurant managers across the country. There's no magic bullet for eliminating waste in commercial kitchens, but you and your staff can make a big push toward a greener work space by making targeted adjustments to how the kitchen operates. Upgrading the restaurant's heating and cooling systems, for instance, can make a drastic impact on how much waste occurs in the front of the establishment, food prep areas and the rest of the facility. "Going tankless is a boon for commercial kitchens." One way to achieve these savings is by investing in tankless water heaters. Replacing aging, reservoir tank heaters with tankless upgrades may be the exact change your restaurant needs to stop wasting money on bloated utility bills. Read on to learn why going tankless is such a boon for commercial kitchens. Standby loss is a common form of resource waste that afflicts a wide range of commercial kitchens. This phenomenon is especially common with sinks. Here kitchen workers often stand by idly as gallons of water rush down the drain, waiting for hot water to travel from the central heater and to the point of use through yards of piping. As a result, your restaurant stands to waste water each time a prep worker or cook needs a flow of hot water. In addition to water waste, heat loss occurs as a result of the process of pumping water from a central heater. No pipe insulation is perfect. The larger your restaurant, the more heat is lost as water flows from one location to the next. These instances of excess energy consumption are likely to manifest as inflated monthly utility bills. In addition to keeping utilities bills from escalating out of control, going tankless helps members of your kitchen staff save time on a daily basis. Tankless water heaters are installed near points of use and are designed to reliably provide heat on demand. This set-up guarantees that employees aren't standing around waiting for water to heat up, wasting precious productivity time, ramping up energy costs simultaneously. In addition to efficiency improvements, going tankless can help your commercial kitchen staff save space as well. Tankless water heaters, lacking a reservoir, are significantly smaller than traditional models. This is especially relevant for smaller kitchen where storage space is lacking. As a result, there are more incentives for your kitchen staff to consider a tankless upgrade when some extra square footage can make a big difference. Pitching a multi-faceted, tankless solution is an easier investment to sell to restaurant owners than a new tank in a potentially less obtrusive location. This goes double for restaurants that are forced to install larger water heaters. Contractors warn larger tanks could lead to more space issues, said the Wichita Business Journal. Don't let an old water heater slow down your kitchen staff. Tankless models boast advantages for commercial kitchens that go beyond energy savings and space economy. 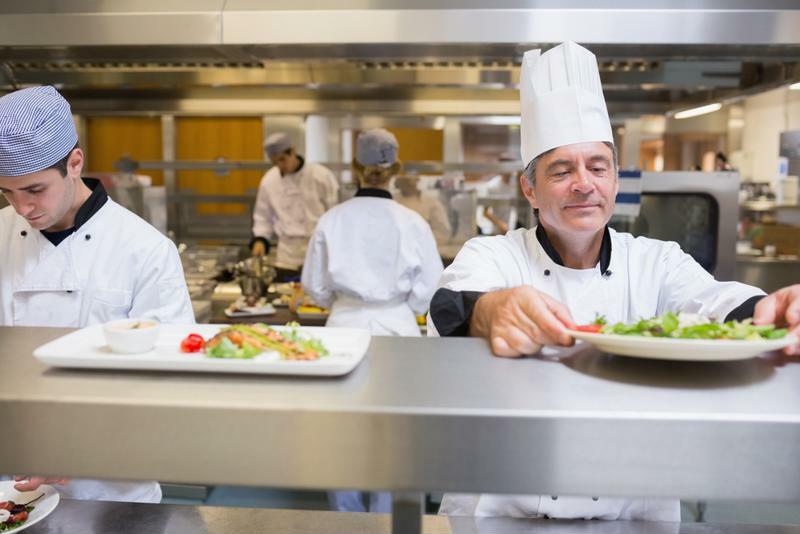 Restaurants and other members of the food service industry must contend with strict water heating standards, especially at points of use where employees are expected to sanitize their hands before working with ingredients, noted The Arizona Republic. High-performance tankless models are designed with innovative, built-in heat controls. This technology ensures that water flowing from the kitchen is always within one degree of safe and sanitary temperatures. In addition to keeping your kitchen safe from compliance problems, tankless water heaters guarantee that the palms and fingers of kitchen workers are free of sickness-inducing bacteria.